After a hiatus of several years the EIA Practitioners Workshop returned this year with 56 people in attendance. 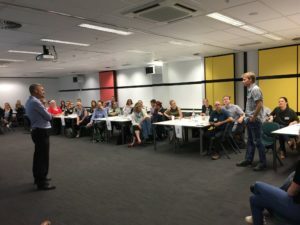 Held in conjunction with the EPA Services Directorate (now part of DWER) the course facilitated by Dr Angus Morrison-Saunders provided insight into the latest practice and approaches regarding Environmental Impact Assessment in WA. The focus was to familiarise new and experienced practitioners with the EPA’s new guidelines and procedures framework that has been in place since late 2016. Special thanks go to ECA committee member Tim Mitchell for his hard work behind the scenes to ensure the event was a success. Due to the level of interest we are looking to run another workshop in the near future. You can register your interest now via our website.